Microsoft Word’s Track Changes and Comments options are the type of features you may not need on a daily basis (unless you’re a professional proofreader), but when you do, you thank God they’re there. Personally, I can’t imagine working on documents and discussing revisions without them. That’s why I used to find it a bit frustrating that you can’t just ctrl+c, ctrl+v the revision markup from Word to Outlook. Luckily, it turns out there is a simple way to copy text along with the markup. …and OK your way back to the document. 2. In the Review tab Switch of the Track Changes option. 3. 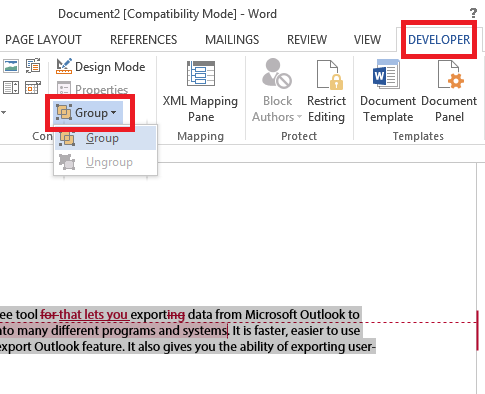 Highlight the segment of text you want to copy to Outlook. 5. Copy the highlighted text, e.g. by right-clicking it and selecting Copy. I am facing a peculiar issue. While the process worked for me (Thanks for the help), only deletions is appearing in track changes . Additions are coming as accepted changes in outlook. Please help. I could not reproduce the bug you have run into. Please make sure you have not ommited any of the steps mentioned in the article. Also check if the problem persists if you choose other paste options, like “keep source formatting”, or “merge formatting”. A tip: After grouping the section required for copy/paste to another place – rest the grouping by Ctrl-Z the way before the grouping was done- otherwise it will mess up the editing functions. Adam the Aardvark….You are 128-bit in my book, not just 32-bit!!! What are your system specifications and language settings? Ugh. So now Remove Content Control did work. I’m not sure what I did differently this time. But the point is, watch out for this issue. Wait. That didn’t work. How do you “unlock” the text that was cut & pasted. I’ve gone back and un-selected Developer in Options, but that text is now extremely limited for editing. Help! Doing this makes the copied text immune from other edits in Word. Suddenly other Word features are grayed out as not available. I just now figured out that you must re-select the text and right-click on Remove Content Control, to return back to normal editing. I’ve just tested it and can confirm that it works on Office Pro Plus 2016. Are you following the article to the letter? Also, do you paste the content into Excel? Superb, works for Word 2007-Outlook 2007 very nicely. Also works from Outlook 2007-Gmail in case that’s an option you need. ADAM AARDVARK 32-BITSTER—THANKEE, THANKEE, THANKEE!!! I TRIED EVERYTHING I COULD THINK OF TO BE ABLE TO INSERT TRACKED CHANGES INTO AN OUTLOOK E-MAIL. NOW WORKS THANKS TO YOU!!! 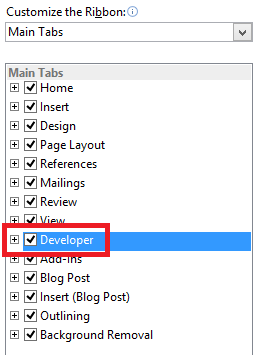 (THE OUTLOOK TOOLS OPTIONS MAIL FORMAT EDITOR OPTIONS ADVANCED TAB DID NOT WORK FOR ME. Hi Marilyn, Before clicking Group, did you highlight the segment of text that you wanted to copy? This did not work for me. The text that gets copied from Word 2013 to Outlook 2013 still doesn’t include the comments or tracked changes. Are there any other settings that must be changed in order for this to work properly? Also, make sure you followed all the steps. One I sometimes forget is switching off Track Changes (step 2).